"Fu Dog Takes A Walk"
The Comedy: Madcap antics as Fu Dog takes himself for a walk through New York City. The Action: Fu must tangle with an evil dogcatcher in order to make his way to a baseball game. "But now I've got you right where I want you---! ACHOO!!" 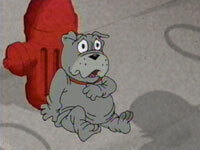 "Fu Dog Takes a Walk" is an 11-minute episode, usually aired with "Adventures in Troll Sitting".